Build a website that’s right for your business and your budget. When potential customers search the Internet for your services, the most basic foundation of your online presence is a website. Customers make decisions based on your website’s quality, usability and information; if you don’t have one, you’re guaranteed to miss out on valuable leads. We’ve partnered with Ferguson Advertising, a third-party team of website developers and digital marketers, to offer a website builder unlike any other you’ll find. 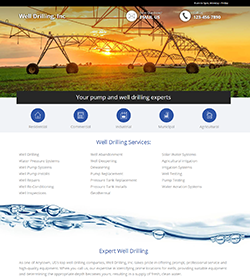 This service will gather information from your Key Dealer profile and walk you through the process step-by-step to create a fully functioning website that is unique to your business and fully optimized to be Google search friendly for the water well drilling industry. If you already have a website but want to build a new one, we can do that as well. Take advantage of this unique opportunity to build your online presence today! When potential customers search the Internet for your services, the most basic foundation of your online presence is a website. Think of it as a window to your company where people learn who you are and what you’re about. Customers make decisions based on your website’s quality, usability and information. Furthermore, paid advertising and directories link customers to your website for the most-up-to-date information. If you don’t have a website, you’re guaranteed to miss out on valuable leads. By creating a simple, Google-friendly website, you will have the power to influence perception of your business and provide a central resource for your customers. 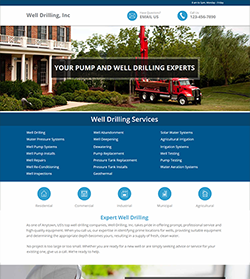 Franklin Electric has partnered with Ferguson Advertising, a third-party team of website developers and digital marketers, to simplify the process of building a website for you. Our website builder service will gather information from your Key Dealer profile and walk you through the process step-by-step to create a fully functioning website that is unique to your business and services. After your website goes live, you’ll be able to add or edit information and photos at any time through your Key Dealer dashboard. 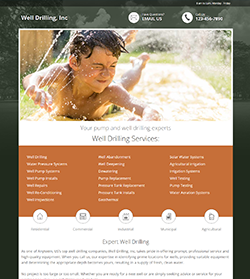 If you already have a website but want to build a new one, we can do that as well. You’ll just need to tell us whether you want to keep your existing website and add a new one, or redirect your web address to the new website. Below are the three website templates we’re offering through the website builder. You’ll be able to customize whichever one you choose with photos, headlines and text to fit your style and your business. Click “Preview Template” under any of the images below to see a working template of the website. Expert Tip: When you’re looking at the preview, be sure to look in the upper right corner of the page to explore your color options as well! How much does it cost? $500, one-time setup fee to Ferguson Advertising. 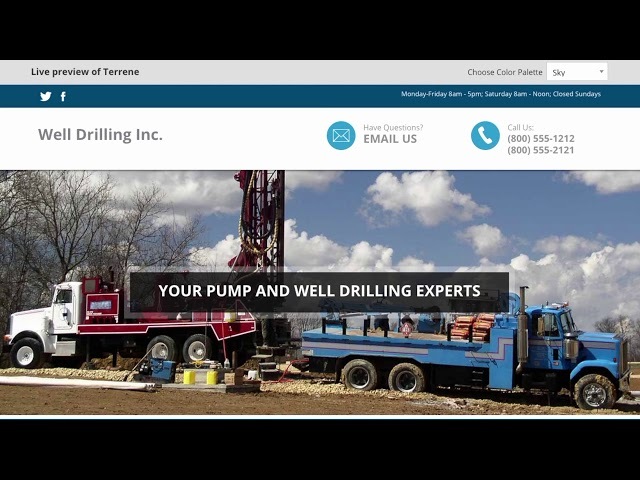 This covers the cost of building and launching your website, including submitting your sitemap to Google, optimizing SEO for the well drilling industry and mobile responsiveness – your website will look good from a desktop computer, tablet or smartphone. How long does it take? The website builder may take around 30 minutes to complete; if you are unable to complete the builder in one sitting, emails will be sent to you periodically explaining status and next steps. Once it’s submitted, your website will be constructed and launched within 2 business days. It may take up to a week after launch for your new website to show across the internet. After it’s live, you’ll be able to edit your website’s information from your Key Dealer Dashboard at any time, and changes will be reflected on your website immediately. Your website will be hosted on a dedicated Franklin Electric server, and Franklin Electric will not charge for this service. For ease of online transactions, only credit card payments are accepted for the website builder. If you are looking for custom features or functions on your website, Ferguson Advertising will be glad to talk with you about your options and associated costs. You can contact them at franklinwater@fai2.com. Your domain name or web address – like www.example.com; if you don’t have one, don’t worry! We’ll show you how to buy one. If you need to leave the website builder for any reason, you will be able to save your profile and come back to finish later.